Mrs. Simpson's order for new dress material has been received; the girls are ready to begin work on it and it should reach her in the next few weeks. 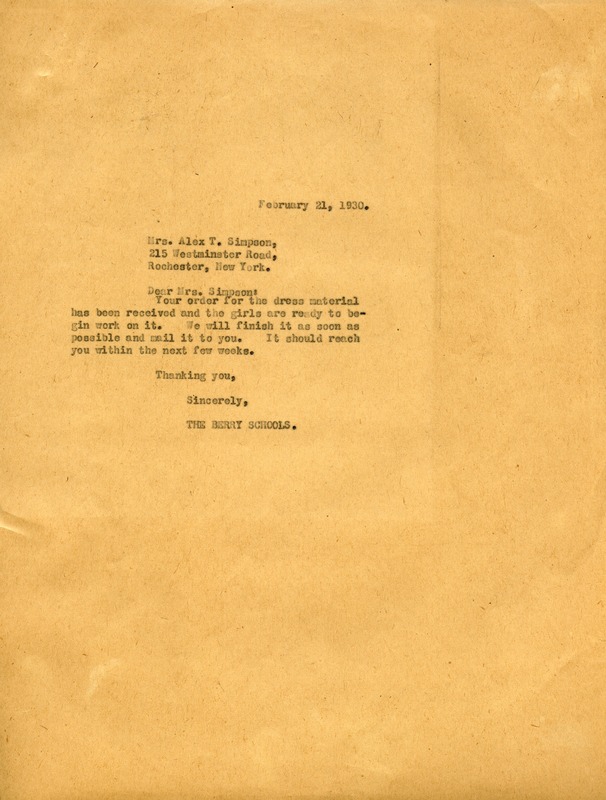 The Berry Schools, “Letter to Mrs. Alex T. Simpson from the Berry Schools.” Martha Berry Digital Archive. Eds. Schlitz, Stephanie A., Jordan Brannen, Sherre Harrington, Meg Ratliff, et al. Mount Berry: Berry College, 2014. accessed April 26, 2019, https://mbda.berry.edu/items/show/13899.